Black is extremely stylish and will always remain the top of my preferences. It suits everyone and thin the silhouette. Additionally, it is a very elegant and noble color, of perfect refinement. I have prepared 5 black dresses in 5 different styles. 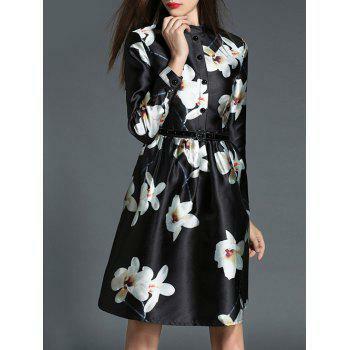 Because you want to be extremely feminine and surprise in the most delicate way, this floral print dress is right for you. Let your hair on your back and appeal to a natural makeup. Your innocence will fascinate their souls and create mystery around your person. Fit this dress with a pair of glamorous glasses, a fine scarf and a clutch and you will get a very refined outfit. A pair of boots will perfectly complement the outfit, and you will feel millions! Fruity, feminine and extremely sweet, an ideal mix for a first date. In this dress you can be sure the others will notice the person! Your finesse and femininity will be overflowing in this outfit! A bodycon dress with a zipper to the back, perfect for evenings in town or club. Refined and tempting, you will seduce instantly! Sensual and exciting as much as you have to be! This asymmetrical dress has a voluminous and transparent game that will increase the desire of others to discover you!